VBites have been making plant based burgers for decades, but with the USA now moving away from veggie burgers using milk and eggs, and joining us by massively marketing their vegan meat burgers as something new, the awareness has risen in the business world. In turn, we are becoming more aware of the health, ethical and environmental impacts. With summer finally with us, all the team here at PBHQ have gone BBQ mad this month to bring you an issue that’s packed full of plant based treats to cook outdoors! BBQ food is not the first type of cuisine you’d usually associate with a plant based lifestyle; in fact some people may think they need to miss out altogether, but we have recipes that everyone will be clamouring to try. Learn how to make authentic, smoky hot dogs, which will have even meat eaters hooked, in our step by step guide. Switch up your kebab game by experimenting with our marinades, or have fun trying out our striking black burger buns. With the evenings now much lighter, more of us are making time to come out of hibernation and socialise in the evening with friends and family. Check out my guide to cooking for a crowd, along with some recipes to impress your guests, plant based or not. For all of you living with partners and family members who don’t follow a plant based lifestyle, be sure to check out a feature from contributor Jessie Keogh, who talks about compromise and being in a relationship with someone who isn't vegan. As ever, we hope you love the recipes and we can’t wait to see your take on them! Don’t forget to tag us on social media using #PBCreations or send your photos into me at editor@plantbasedmag.com. I’ve thoroughly enjoyed the challenge of guest editing this month, as well as being busy creating recipes to share with you all. 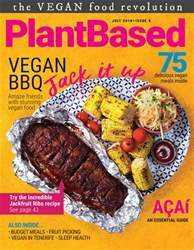 If you have a plant based food question don’t forget to email me at editor@plantbasedmag.com for a chance to have it included in a future issue.